The bowling shirt is a unique work of art. With patterns and colors as varied as the bowlers who wore them, bowling shirts reflect a time when Americans loved their big cars, drive-ins, bowling alleys, and flashy clothing. 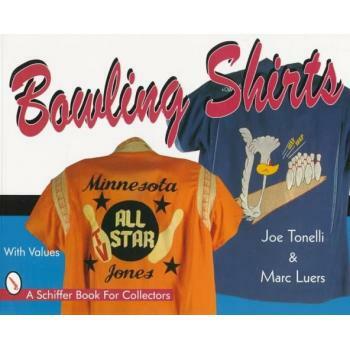 This book showcases a wonderful collection of bowling shirts, each with its individual art work. In over 600 color photographs, the shirts are displayed alphabetically by manufacturers. Embroidery and design detail, manufacturers' labels, and special features are shown along with a complete description and value guide. Drawing on over twenty years of collecting experience, the authors have assembled some of the best bowling shirts of this era. This book is a treat for anyone interested in the beautiful art created for the sport of bowling and for collectors of vintage clothing. 600 color photos.